Lagos State Commissioner of Police, Imohimi Edgal meet with no fewer than 500 youths renounced their membership of different cult groups in Ijede town, Ikorodu. For a community that has been at the receiving end of all the evil of cultism, Monday, November 6 will not be forgotten in a hurry. No fewer than 500 youths renounced their membership of different cult groups in Ijede town, Ikorodu. 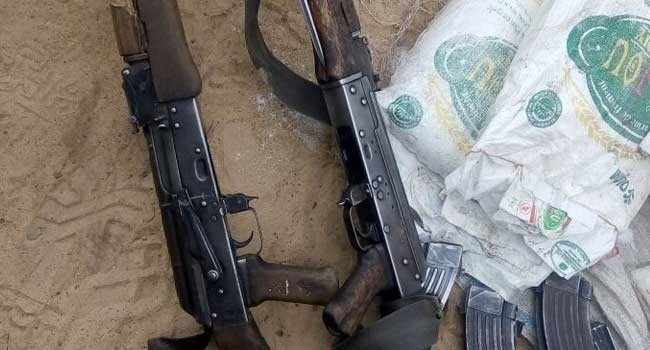 AK 47 rifles, pomp action rifles, locally made pistols, AK-47 magazines, axes and cutlasses amongst others were some of the weapons they surrendered to the police. The event was witnessed by political leaders in Ijede and parents of some of the ex-cultists. The Lagos State Commissioner of Police, Imohimi Edgal was there to personally see things and he pledged to profile the repentant youths and put them under close watch. The leader of Eiye cult in Ijede, Abdulazeez Jensi said they were tired of being chased about and needed peace of mind. Another, Olanrewaju Adesoye, a member of KK cult group noted that he decided to give up his membership for the safety of his life and community. “The crisis is becoming too much. I am tired, and I want to be safe. The crisis was becoming too much,” he said.